Family Alliaceae J. Agardh genus Allium L.
A. rotundum L. subsp. waldsteinii (G.Don. fil.) Soo, A. rotundum L. subsp. waldsteinii (G.Don. fil.) K.Richt., A. scorodoprasum L. subsp. waldsteinii (G.Don. fil.) Stearn, A. paterfamilias Boiss. Herbaceous, perennial, bulbous plant. Bulb is ovoid, with dirty brown, leathery, splitting outer skins. Skin of numerous, tiny, alternate bulbils is dark purple. Stem is (30) 40-70 cm tall. Leaves, 4-5 in number, are not fistular, but linear, grooved, smooth or scabrous at the edges. Umbel is globular or, less frequently, hemispheric, dense, polyanthus. Pedicels are unequal in length, considerably longer than the perianth. Tepals are dark purple-violet with a darker vein, 4-5 mm long, uniform in length. Filaments are 0.25 to 1.5 times shorter than the tepals. Blossoms in June-July. Entomophilies. Spread throughout Central and Southern Europe, central and southern regions of the European side of the former USSR, and the Caucasus. Grows in brushwood, clearings, meadows, and on mountainsides as high as the middle mountain zone, most often as a weed. For food (vegetable) and ornamental purposes. Useful qualities of this species have as of yet been poorly explored. Vvedensky, A.I. 1935. 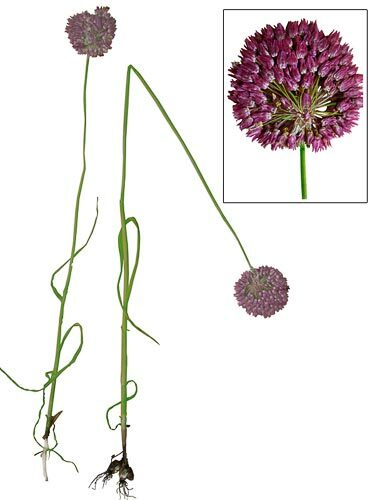 Onion - Allium L. (Flora of the USSR, vol. IV.) Leningrad: Publishing House of the USSR Academy of Sciences, pp. 248-251. (in Russian). Grossgeim, A.A. 1940. Flora of the Caucasus, vol.2. Baku: Publishing House AzFAS, p.117. (in Russian).